Dollar jumps notably in early US session against Swiss Franc and Yen following stronger than expected ADP job report. But strength in the greenback is not broad based. Traders are cautiously await FOMC statement and press conference, to see how cautious Fed would sound. There is prospect of a stronger comeback in Dollar should Fed doesn’t sound dovish at all. In addition, any news from meeting of Chinese Vice Premier Liu He and US Trade Representative Robert Lighthizer will also be closely watched. Staying in the currency markets, Australian Dollar remains the strongest one for today following stronger than expected CPI reading. Canadian Dollar follows closely with help from rebound in oil price. Sterling is mildly higher today as Brexit uncertainties continue. The Pound is the weakest for the week following yesterday’s Brexit development. While UK Prime Minister Theresa May is seeking re-negotiation on Irish backstop, EU shows no sign of backing down from the stance of not reopening negotiation. 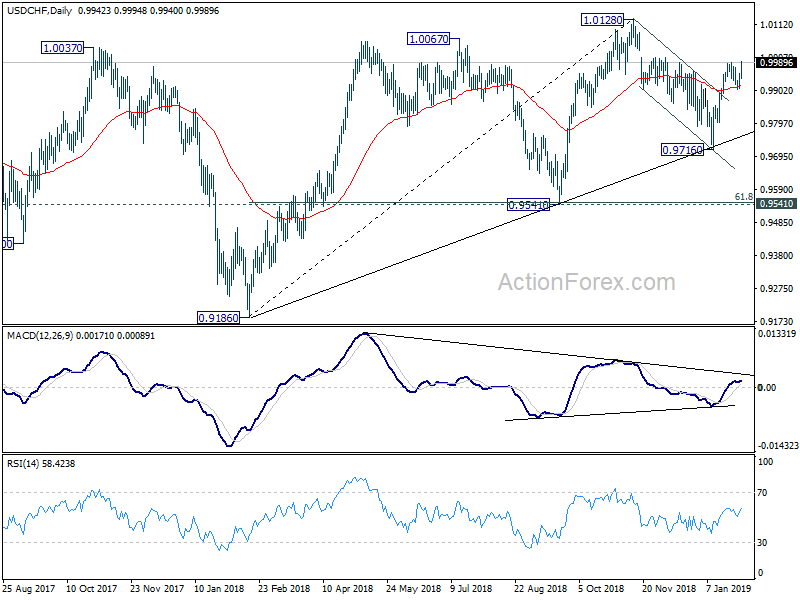 Technically, USD/CHF’s break of 0.9990 resistance suggests resumption of rally from 0.9716. The pair should now head towards 1.0128 key resistance. USD/JPY will likely take on 110.00 resistance too. For now, AUD/USD is held below 0.7235 resistance, and thus, it’s staying in near term consolidation. Similarly, USD/CAD is held above 1.3180 support and is staying in consolidation too. In European markets, FTSE is up 1.67%. DAX is down -0.29%. CAC is up 0.75%. German 10-year yield is down -0.0123 at 0.191, back below 0.2 handle. Earlier in Asia, Nikkei closed down -0.52%. Hong Kong HSI rose 0.40%. China Shanghai SSE dropped -0.72%. Singapore Strait Times dropped -0.42%. Japan 10-year JGB yield dropped -0.0014 to 0.003. US ADP report shows 213k job growth in private sector in January, well above expectation of 170K. Prior month’s figure was revised down slightly from 271k to 263k. Ahu Yildirmaz, vice president and co-head of the ADP Research Institute said in the release “the labor market has continued its pattern of strong growth with little sign of a slowdown in sight”. And, there was “significant growth in nearly all industries, with manufacturing adding the most jobs in more than four years”. Fed is widely expected to keep federal funds rate unchanged at 2.25-2.50%. Since December, following extreme market volatility and cautious turn in Fedspeaks, pricing of Fed’s rate path changed drastically. Fed funds futures are now only pricing in around 20% chance of a 25bps hike by the December meeting. Dollar then started weakening broadly. The greenback suffered another round selloff last week after a WSJ report suggesting that the Fed members are considering to end the balance sheet reduction plan earlier than previously expected. But since then, Fed officials sung a chorus, saying that Fed can afford some patience before another rate move. And Fed chair Jerome Powell even indicated that Fed is flexible to move in either direction if necessary. Any change in the forward guidance that hints at a pause could give Dollar more pressure. And secondly, Powell will need to indicate if there is any change in Fed’s balance sheet reduction plan. German CPI dropped -0.8% mom in January, matched expectation. But annual rate slowed sharply to 1.4% yoy, down from 1.7% yoy, and missed expectation of 1.6% yoy. Today’s German CPI miss should weigh on expectation for Eurozone CPI reading to be released later in the week, it’s expected to slow to 1.4% yoy. Germany Gfk consumer confidence rose 0.4 to 10.8 in February, above expectation of 10.3. Gfk noted that rising income prospects and an increasing propensity to buy mean that the consumer climate is improving once more. This is further reinforced by a decrease in propensity to save in January. French GDP rose 0.3% qoq in Q4 2018, same pace as prior quarter and matched expectation. Looking at the details, household consumption expenditures decelerated (0.0% after +0.4%), likewise total gross fixed capital formation slowed down (GFCF: +0.2% after +1.0%). Overall, final domestic demand excluding inventory changes decelerated: it contributed 0.1 points to GDP growth, after 0.5 points in the previous quarter. Imports bounced back in Q4 (+1.6% after −0.7%) and exports accelerated significantly (+2.4% after +0.2%). All in all, foreign trade balance contributed positively to GDP growth again: +0.2 points, after +0.3 points in Q3. Conversely, changes in inventories contributed negatively to GDP growth (−0.1 points after −0.5 points). Also released in from Eurozone, Eurozone business climate dropped to 0.69 in January, economic confidence dropped to 106.2, industrial confidence dropped to 0.5, services confidence dropped to 11.0, consumer confidence was finalized at -7.9. Swiss KOF Economic Barometer dropped for he fourth time in a row to 95.0 in January, below expectation of 98.1. It’s now 5pts below its long term average. Australian CPI rose 0.5% qoq in Q4 versus expectation of 0.4% qoq. Annual rate slowed to 1.8% yoy, down from 1.9% yoy, but beat expectation of 1.7% yoy. RBA trimmed mean CPI rose 0.4% qoq, 1.8% yoy, matched expectations. RBA weighed media CPI rose 0.4% qoq, 1.7% yoy, basically matched expectations. Also release in Asian session, Japan retail sales rose 1.3% yoy in December, above expectation of 0.9% yoy. Consumer confidence dropped to 41.9 in January, down from 42.7, beat expectation of 42.5. 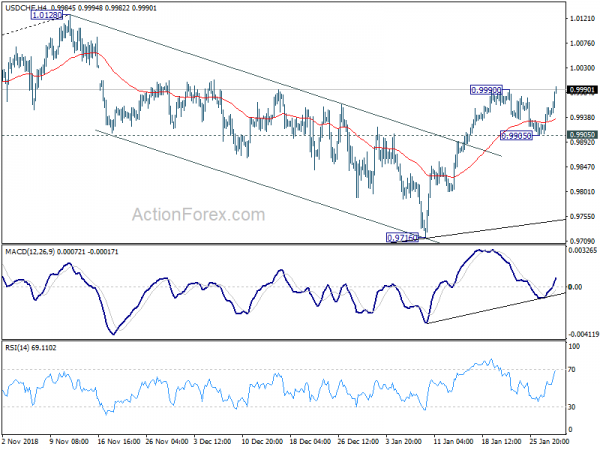 USD/CHF’s strong rally and break of 0.9990 resistance suggests resumption of rise from 0.9716. Intraday bias is back on the upside. As noted before, corrective pull back from 1.0128 has completed at 0.9716 already. Rise from 0.9716 should target 1.0128 resistance next. On the downside, break of 0.9905 support is now needed to indicate completion of the rebound. Otherwise, outlook will remain bullish in case of retreat.